This entry was posted in Comments about Cycling on March 17, 2014 by Steve Tilford. Okay, I was planning on doing a race update for the weekend, but feel the need to post on proper pinning number etiquette. I’ve had a ton of experience pinning numbers. I’ve been doing it for decades. I have to admit, I’ve been spoiled and for a long time there, I didn’t have to pin numbers, but just gave them to a support person and leaned over. Before cameras, the number used to be pinned like we sometimes do on cyclocross. On the back pocket and then on the front of the sleeves. Anything to make reading the numbers easier for the officials. That just got me thinking about picking finish order in huge field sprints back then. Sometimes I’d help out and realized the hardest places to pick are further back in the field, like 9-10-11. Pinning numbers properly was way more important then. Since cameras, the pinning is all on the back. At local races, I still just pin my number on whatever side the officials are standing, on the lower pocket. But all the rest of the races, scapula numbers and then pocket numbers. I hate pinning numbers. Especially for cyclocross when they give you four and you have to put two on your back and then two smaller ones on the front of your arms. Trying to get these flat yourself, on a skinsuit is nearly impossible. Peter Stetina, of the BMC team, did an interview about getting rid of numbers completely. He wants Profeesional riders to have permanent numbers and individual jerseys. I have to applaud that. Let get rid of numbers and just use timing chips. You’d probably still have to have one number, for officials to identify you, but that would be better than 4. MTB racing is so easy sometimes with only having to attach a number plate to the front of your bike. 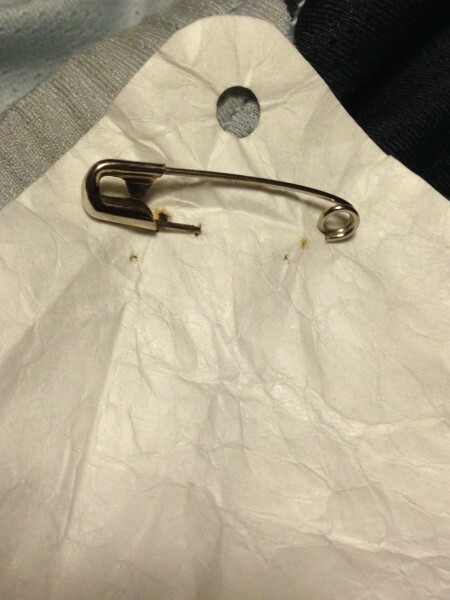 But this isn’t really about the history, of even the position of the numbers, it is actually about the safety pin and the proper way to use it to pin the number flat. They best way to get a number pinned on correctly is by having someone else to do why you are wearing your jersey. That way the jersey is pre-stretched correctly and the number will lay flat. But, that usually isn’t the case when a bunch guys go together and have their own number issues. The first mistake pinning a number is the orientation. I blame most upside down numbers on nervousness. You see it more in Cat 4/5 fields than others. You never see it in a Pro 1/2 field, unless it is number 13, which is most the time pinned upside down, for superstitious reasons and maybe also number 69, which you might not know is right side up or not. Anyway, make sure the number is right side up. You need to pre-stretch the jersey to get it flat. You can do this on a pillow, a steering wheel of your car, by just stretching it and then sitting on it, having the jersey in your lap. But you need to stretch it both directions for the number to lay flat when you’re wearing the jersey. Now, the real reason I’m writing this. The pins. You have to go through the number twice with the pins. You can just stick the pin through the jersey, then through the number and close it. Look at the photos below. Photo #1 is correct pin placement. Photo #2 is incorrect. Incorrect number pinning allows the number to raise up off the jersey, the length of the safety pin, thus allowing it to flap in the wind. I saw way too many cases of this sort of number pinning yesterday at the race. It was mildly irritating, thus this post. Okay, I’m sure you all will come up with a bunch more better number pinning tricks. Like I said above, I hate it and am not great at it. Lack of patience, nervousness at the race or something. 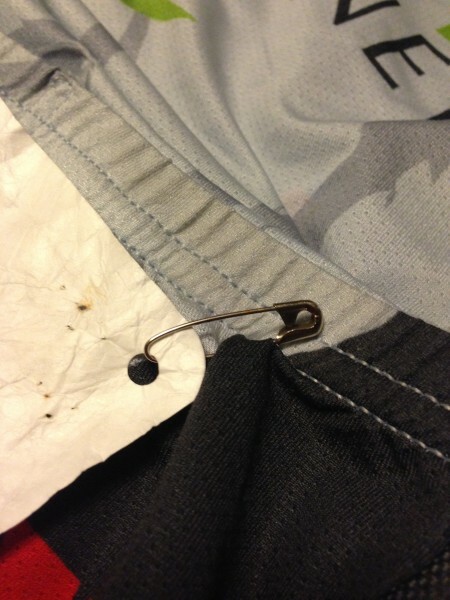 The wrong way to put the safety pin. I usually pin the number on all side, including a pin on each side, between the corners, plus it is becoming standard, a pin in the middle on the number to hold it down flat. Easy solution for pinning numbers on correctly would having self adhesive #’s….surely in this day and age they cannot be price prohibitive…. Did you catch Tirreno this morning? Awesome chase the last 20km with a great last 2km, well minus the Lotto crash of course. I used to be a Miyata Dealer in the late 80’s early 90’s. Team Miyata’s came with number plate tabs just under the top-tube. They were easy to see for the officials. I don’t know why they went away from them. The same affect can be achieved with zip ties. Thank you, thank you, thank you. This is a basic skill but is also something that is never purposely taught. Even at elite events, you see poorly pinned numbers. Riders can miss a place by 0.001 of a second, and yet they have a parachute with their number. Just one addition- the “pre-bent” safety pins are nice, and make it easy to work through the number and jersey, with hitting the skin! How about getting some of this down on paper, or an e-book? “How to Win” by S. Tilford. Get a good second author and editor, and go for it. There is the need, and also the want. Use you stories to make your points come alive. I made a video a couple of years ago using your method. I usually make some of my newer teammates watch it every year. I’ve been officiating, and racing, since the Nixon administration and I have to say that the location in which you pin your numbers depends a lot on the technology at the race. When we use our true finish line camera, we want the main number pinned on the upper side of the jersey (which usually means obscuring some of the sponsor info on the side panel). If the camera is not positioned very high, as often happens when there is no scaffold or stage for the officials, it’s better for it to be lower on the side. If the camera is up high, it’s better for it to be higher. The back number is useful mostly for the on-course officials and, when there are mixed categories in the same race with different number sequences, the other racers. The back number is also helpful as backup (no pun intended) for the finish line camera in case some side numbers are hidden by riders nearer the camera. We usually run a camera pointed just slightly downstream in order to catch those numbers. For some races we also use the shoulder numbers as well and although we all hate to have to wear and pin those, they are really, really helpful for the officials when scoring criteriums. Even dorkier, but very helpful for officials are the small stick-on helmet numbers. Having just two numbers on the back pockets doesn’t help much unless you are also running chip timing, but are great for spectators, photographers, follow car officials, etc. I do wish we could order numbers without the holes in the corners! New riders always want to use those holes which keeps the number for lying flat and usually results in one or more of the pins tearing through the corner. “Let get rid of numbers and just use timing chips. You’d probably still have to have one number…” Yeah, your UCI or USAC numbers, or both, on an RFID chip in the stem, you could set the numbers at on-site registration using relatively cheap technology, it would give far more accurate timing at the finish line, and race organizers could save lots of $$$ on numbers. Excellent idea. Spray lightly, let the solvent flash off, press to apply. At the end of the race, peel it off. A quick spritz of Goo-Gone to any remaining adhesive on the jersey before tossing in the laundry and *bam* good to go. No rust stains from sweaty safety pins, no getting stabbed by a team-mate pinning on your number, no flapping number, no holes on the jersey and loads faster than pinning. Chip timing for the small kids triathlon my team puts on costs north of $1000, and when it comes down to a photo finish, they aren’t nearly as accurate as a good camera system is (like the one they use in Texas). I think you would still have to have a camera in addition to the timing chips. Joey Mesa and I were talking about race numbers a while back. We decided it would be great if riders were issued a race number for the entire year, based on your ranking in a given category. For example, the top ranked cat1 in Oklahoma could be number “OK1” for the entire season. The top ranked cat3 in Kansas might be “KS301”. If you move or upgrade, you just take that number with you until the end of the season. USAC could print those numbers on a stretchy fabric material and you can sew or pin your number to a skinsuit or jersey for the entire season. In speed skating, we used to have fabric numbers. You sew it once at the beginning of the season, and never had to think about it again. I could see the need for having 3 numbers. One on each side panel on one over the center pocket. Agree with Dale…Super 77 adhesive is the only way to go. I’ve been using it for years. Perfectly flat numbers and no pins. Numbers will even stay on thru a washing machine/dryer! (I usually forget to remove them). Besides being too slow the wonky number stuff is another good reason not to race. Zip the jersey part way, maybe 3/4, and then stick your legs through the base and out through the top. In the seated position your knees will press snugly into the shoulders of the jersey. Spread your legs to pre-stretch the jersey as much or as little as you want and you have a perfect pinning pre-stretched surface. But I think I’ll try this 3M stickums now. What’s your theory on why the corner holes in a race bib number even exist? Washington has started something smart this year. You get one set of nice fabric numbers and a frame number for the whole season. Use all the time, no numbers to deal with at race…unless you are from out of state, then you have to rent a paper number on site. On a related topic, each year at the Chequamegon Fat Tire Festival my staff members dread the night I bring out the 10 – ten gross boxes of safety pins, that’s 14,400 individual pins that we then collate into group of 4 for easy grab at bib pick up. It is one of the talents my long term staff has developed over the years. I wonder how many other events collate their safety pins? Another vote for the 3M adhesive. The stuff is amazingly tacky and keeping the number flat is a piece of cake. Just remember to peel it off when you finish. MUCH better than pins in every way. The self-adhesive numbers issued at the Tours of Qatar and Oman seemed like a good idea. But on a windy day, and with a variety of fabric mixes for jerseys, ultimately everyone was still using pins. 9 pin is the way to go. Our cameras are pretty low, so back numbers aren’t a great idea. Our officials do not care for wrinkled numbers. The fact that teams, bike makers, and clothing manufacturers spent an incredible amount of time and money trying to make everything aerodynamic, and then have to pin paper to their jerseys, is beyond stupid. Permanent numbers is the way to go. The pinning method in the second photo is JANKY! I use the same technique as third photo without the crumpling. I used to bend the corners over and pin but – ‘no mutilation of the numbers’ (why I don’t crumple). If I’m a pin head for all the pins, so be it. Will have to try the 3M Adhesive 77. Sounds great. The women’s idea sounds nifty for proper stretch too. Thanks! Our technique for mess free Super 77 adhesive. – Put jersey on and get into “riding position” and then have the friend press the number on where you want it and rub it on to adhere it. Steve , do you save your numbers ? If yes it must be a huge collection. In SoCal, back in the early-mid-80s, members of the SCCA had permanent numbers. It saved us so much hassle when we’d pre-reg. Non members had to pay a surcharge at the races of SCCA-affiliated clubs. A USCF rule change in ’85 squashed that, so the permanent numbers went away (as did the SCCA). What I hated was how certain officials would dictate to us how (precisely) we could pin our numbers on. I could understand them telling us “where” to put them, but in the (then) age of paper numbers, I would get pissed that they’d tell us that we couldn’t fold the corners, angle them, etc. I remember guys getting DQ’d for folding the last 1/2 inch of the number at the corner. Like it mattered one damn bit (which it didn’t). Paper numbers sucked. They almost always ripped after getting wet, and if you had to carry food in a road race, those numbers usually took a beating. With modern consumer-grade digital video cameras, it really isn’t hard to effectively photo-finish the race. All you need is a step-ladder that gets the timer a few feet up off the ground. Even if you can’t see the guy’s number clearly, trust me, the guy who thinks he placed will show up (along with the correct bike and jersey). This is all doable. I also became known as the “pin guy” in my club, as I never assumed the race promoter had remembered to buy pins the night before. I always had several sets with me, as the registration table was often out of them after dealing with all the Cat4’s and Cat3’s. A smart racer always packs a gear bag the night before, so as not to forget the helmet, shoes, socks and pins. Always bring your own pins. When we lived in Oregon and raced under OBRA. You got a set of Lycra numbers every year. It was your number for everything except MTB. It was great. I wonder why the state or local associations don’t do it. It would save the promoters a ton of money. No. We’ll, I’ve saved a few important ones, but normally I don’t. 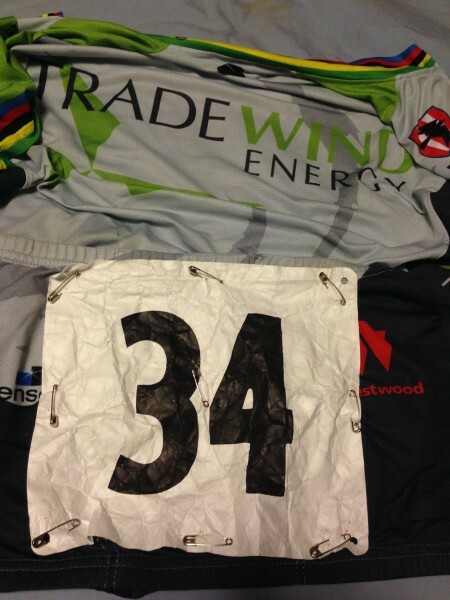 I’ve left the numbers pinned, plus the mud/dirt on my National jerseys I wore winning Master’s Cyclocross Worlds. I’m not sure why I did that. Probably too late to wash them now. Long time reader, first time poster. Todson (company who handles brands like Topeak) sent us a sample they wanted us to consider distributing: Bibbits. They’re four, small, circular, powerful magnets paired with four corresponding, small rectangular magnets that are worn inside and outside a jersey respectively. The magnets hold the number in place at the corners. We tried them out and they actually work pretty good, but if you’re racing cross and you lay in down in a corner or something, no way these things stay on. Just thought you’d like to know bike manufacturers are definitely thinking of racers and the eternal quandary of race number application. Great blog, as usual! For our road and track events we typically use one true photofinish camera (RapidCam) plus two regular cameras and routinely place every rider within 15 minutes. If it takes longer it’s usually because of bad scoring of lapped riders in a crit or badly placed or folded-over (pin pulled out) numbers. Chip timing is relatively expensive and requires additional finish line staff and software to tie into the rider registration and license data, especially for stage races and criteriums where pack timing and free laps come into play. It can work well, but only in the hands of very experienced people. I have seen more chip-timing disasters than successes at the local/regional level when promoters employ timing companies more accustomed to triathlons and gran fondos. The winner of a bike race is determined by the first tire to break the vertical plane at the finish line, not which chip crossed the line first, and using photofinish cameras we often see differences in the thousanths of a second between one bike and the next. I consider chip timing to be a nice backup system for races with large field sizes but would never use it without a camera at the finish line. For gran fondos and mountain bike races they are much more useful. A couple of companies make lycra type numbers which cost around 60-75 cents each depending on quantity. For a typical local road event with multiple fields where you want separate number sequences we might order two sets of 500 or 600 numbers and actually use only 200-250, so we stick to the tyvek numbers. If you think your tyvek number is what is keeping you from winning road races against the other riders withtyvek numbers, you might be a little bit delusional. Steve, at the Pace Bend cat 5 race, the Race Official singled me out during his pre – race lecture about pinning numbers. After seeing many cat 1/2/3 racers starting with crinkled numbers, before I pinned mine on I crinkled it up too… I’m no roadie, I’ll admit. I used the holes in the corners (and added a few more ) to pin my number on. So the USA cycling official said that my crinkled number was a violation, “That is $20 fine! Read the rulebook! ” he snarled. I quickly apologized, but he didn’t let up. “So how would you like to pay me? Will you pay now or after the race?….” My question is, have you Steve or any of the other readers out there encountered issues with a having crinkled number? I only did it cause I saw the many many of the cat 1 and 2 doing it… Maybe officials don’t bother those cat’s because they are more “pro”… ? chris-the crinkled number rule is BS. I’m going to talk to someone on the USAC board to get that rule removed. You pin a number on a skinsuit the night before a race, put the skinsuit in you bag to drive to the race and then take it out, it is crinkled. Any number you use for more than one race is crinkled. Once the jersey is removed and stuck into a bag, it is wrinkled for sure. Not even talking about those that wash their jerseys with their numbers on. Officials seem to be more police now than ever. A great official at a bike race is one you don’t even know is there. We’re all supposed to be doing this thing together to produce a result. And that result is a fair competition, reducing the health/dangers inherent with the sport, and have an accurate finish order recorded. Hopefully, the USAC will get rid of that rule. Oregon has been doing that for 10 or 15 years, minus the frame numbers. As in most things bike racing, OBRA leads the way. I’m surprised no one has mentioned the soon-to-be-available RaceDots. There has been a lot of buzz about them since late last year. Hopefully those will be a good solution. I’ve always been told not to crinkle numbers, “it makes it harder for the finish line camera to see”. Not sure I agree, but I sure don’t want to upset some grumpy official who didn’t get enough love from mommy and decides to take it out on a group of guys playing bicycle racer for a day. Anyhoo, a trick I recently learned from a teammate is to actually hold the number by either side and drag/rub it back and forth across the edge of your open car door, or a table/desk or something, as if you are trying to smooth crinkles out. It removes a lot of the “stiffness” / “starchiness” from the new number without actually crinkling it.